Finally you get this new Phone – iPhone 6 Plus with a 5.5-inch IPS LCD display with 1080p full-HD resolution and a user interface that has been optimized for the larger screen. Hence, no doubt that iPhone 6 Plus will brings a more enjoyable HD video experience to you. Blu-ray/DVD ripper becomes more and more popular to back up and digital copy DVD/Blu-rays for easily watching. As a movie fan, you may want to watch Blu-ray and DVD ISO/IFO movies (from Mac) on your iPhone 6 Plus, but these files can’t be played directly. Thus, in order to watch Blu-ray and DVD ISO/IFO movies on your iPhone 6 Plus, you need to convert those Blu-ray and DVD ISO/IFO movies to an iPhone 6 Plus-friendly format (e.g. MP4). Is it possible? The answer is yes. Here, Pavtube BDMagic for Mac with supported Mac OS X(Include Lion and Mountain Lion) can help you easily convert BD/DVD ISO/IFO to your iPhone 6 Plus fast while keeping excellent video quality. It also support almost all other popular video formats, including AVI, WMV, FLV, MKV, AVCHD, VOB, etc. In addition, it allows you to edit the output videos by trimming, cropping, adding watermarks, etc. If you are working on Windows, please turn to Pavtube BDMagic to finish the Blu-ray and DVD ISO/IFO movies to iPhone 6 Plus conversion task. 1. Want to get mp4/mkv/mov files with multiple audio tracks and subtitle streams? Don’t miss Pavtube ByteCopy for Mac. 2.Find everything about the new releases of Apple iPhone 6 and iPhone 6 Plus on Pavtube Special Topic: iPhone 6/6 Plus topic page. Below is the step-by-step tutorial to convert Blu-ray/DVD ISO/IFO files to iPhone 6 Plus on Mac OS X Mavericks. Step 1: Load Blu-ray/DVD ISO/IFO movie files. Run this Pavtube BDMagic for Mac and load ISO image files. It also supports Blu-ray discs, Blu-ray folder, DVD discs and DVD IFO/ISO. 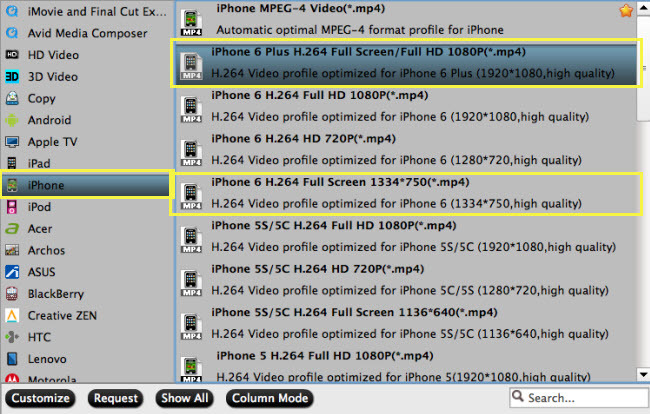 Step 2: Choose video format for iPhone 6 Plus. Click “Format” drop-down list and choose “iPhone > iPhone 6 Plus H.264 Full Screen /Full HD 1080P(*.mp4)” as the most compatible preset with best video quality for iPhone 6 Plus. Or you can choose other presets if you don’t need full size videos. Note: If you have the iPhone 6 and trying to play the Blu-ray/DVD ISO/IFO movie files for smoothly playback, you can also get the right answer. Step 3: Customize video specs for iPhone 6 Plus(Optional). Click “Settings” to free change video resolution, bitrate(quality), frame rate and other settings. Remember the file size and video quality is based more on bitrate than resolution which means bitrate higher results in big file size, and lower visible quality loss. You can hit the big red “Convert” to start converting Blu-ray/DVD ISO/IFO to MP4 with best video settings for iPhone 6 Plus on Mac OS X Mavericks. After the conversion, click “Open output folder” in the conversion window, or “Open” in main interface to quick locatethe converted video. After getting the converted movies files,you can transfer them to iPhone 6 Plus via iTunes. It is still fantastic and worth to wait for these who are not enjoy Blu-ray and DVD ISO/IFO on new iPhone 6 Plus. Come on and have a try! It will not let you down.